We currently have a program designed for distributors to generate business opportunities and growth. Being a Territorium Partner requires dedication and commitment, but do not worry! we will be supporting you from the beginning to acquire the necessary knowledge and to bring our passion for the educational revolution to more people. In this scheme the Refferal Partner should recommend the platform and Territorium. Have the opportunity to offer the Territorium platform to clients and generate incredible results by acquiring the platform through a Territorium wholesaler. Have the opportunity / benefit to offer the Territorium platform and account follow-up as a leader. Have influence and sales opportunities validated by Territorium. Have the obligation to follow up as a leader, can choose to implement and develop the Territorium platform by charging these services directly to the client (this action is optional). Must have a team focused on the distribution and service. Get the highest commission and you have the obligation to follow up as a leader, can choose to implement and develop the Territorium platform by charging these services directly to the client (This action is optional). Must have a team focused on the distribution and service. 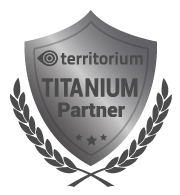 Are you interested in becoming a Partner Territorium? Contact us through a message and we will contact you as soon as possible.